These are the best brownies in the world. Don’t believe me? Make them and see for yourself. 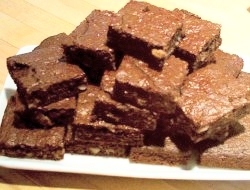 This is my sister Naomi’s favorite brownie recipe, adapted from one my mom used to make. Here's the background of these fabulous, moist brownies. When I was eight years old I played soccer for the Rainbow Racers and we were undefeated. My mom made these brownies for us and boy--they are so good you'll eat them all day! Melt butter and cocoa in microwave, stirring often. Beat eggs, adding sugar slowly. Add warm mixed butter and chocolate; blend in flour, vanilla (and nuts). Bake in greased and floured 8" pan for 35 minutes or so. Important: DO NOT OVERBAKE! Brownies will be very moist in the middle (that's the best part). Toothpick test is not accurate for these yummy brownies.